The brave and plucky performances by Wales and Iceland lifted the spirits of everyone during the UEFA European championships this summer. Wales kept high the hopes of these islands for an extra week or more after the Republic of Ireland, Northern Ireland and England were eliminated one by one at the end of June and the beginning of July. This was the best performance by Wales in international soccer since reaching the World Cup quarter finals in 1958. My eventual late support for Wales followed the elimination of the other island nations, and passions ran high in bars across Crete as tourists clustered and huddled around televisions bars in the resorts. It all brought back happy memories of a visit to Wales just before summer. I had gone to visit Portmeirion, the romantic village built by Sir Clough Williams-Ellis, and to see remote Frongoch, where Irish revolutionary leaders were kept prisoner after the 1916 Rising. Records a sign, a murder or a groan. The new town was populated with people mainly from Lancashire and Cheshire, including the Bulkeley family. The parish church of Saint Mary and Saint Nicholas was built in the heart of the new, walled town ca 1330. The oldest parts of the church date from the 14th century, while the chancel was rebuilt around 1500. Later additions date from the 19th century. Inside the south porch, the stone tomb of Princess Joan of Wales is older than the church itself. Princess Joan was an illegitimate daughter of King John of England and married to Llywelyn ap Iorwerth, or Llywelyn the Great, then Prince of Wales. When she died in 1237, Joan was buried at the Franciscan Friary her husband had founded in Llanfaes. When the friary was suppressed at the Reformation, Joan’s tomb was lost. Centuries later it was found in Beaumaris being used as a water trough for horses; it was rescued and moved into the church. The church has a unique collection of misericords from the 15th and 16th centuries, decorating the undersides of the seats in the choir stalls. They include a bearded pope, a woman in a crown with a wimple and a hood, and a woman with a crown of roses. One carving depicts a woman with a pair of tankards filled with ale balanced on her head. Perhaps she brought drinks to the woodcarvers as they worked. The church has an impressive alabaster altar tomb of William Bulkeley, who died in 1490, and his wife Elin, lying side-by- side, with William’s feet resting on a lion. Around its base, the tomb is decorated with figures of bishops and saints. Sir Richard Bulkeley (1533-1621) was appointed Constable of Beaumaris Castle in 1561 and became the first Mayor of Beaumaris in 1562. In 1563, he was elected MP for Anglesey for the first time, and he became High Sheriff of Anglesey in 1570. He was accused of oppressing the people of Beaumaris, and of being involved in the Babington plot in 1586. But he was cleared and became one of Queen Elizabeth’s courtiers. Bulkeley’s younger half-brother, Lancelot Bulkeley (1568-1650), remained rector of two parishes in the Diocese of Bangor when he was appointed Archdeacon of Dublin in 1613. He became Archbishop of Dublin in 1619, and he provoked a riot in Dublin in Christmas 1628 when he tried but failed to prohibit the public Roman Catholic celebration of the Mass. In 1635, Archbishop Bulkeley built Old Bawn House near Tallaght. The house was built in a late Tudor style, with high pointed gables, many windows, 12 chimneys and a chimneypiece reaching to the ceiling that depicted the building of the walls of Jerusalem. The house probably had a moat and drawbridge, and there was a large pleasure garden. Throughout the Cromwellian wars, Bulkeley remained a loyal Anglican, and he was jailed in 1647 for resisting the prohibition of the Book of Common Prayer. After the execution of Charles I, all Bulkeley’s honours, privileges, castles and estates were confiscated in 1649. When he died a year later in Tallaght, he was buried in Saint Patrick’s Cathedral. His son William Bulkeley was a canon of Saint Patrick’s Cathedral, Dublin (1626-1636), Rector of Rathfarnham (1636), Dean of Christ Church Cathedral, Dublin (1630-1671), and Archdeacon of Dublin (1640-1671). Another son, Sir Richard Bulkeley (1634-1685), was High Sheriff of Co Wicklow (1660) and MP for Baltinglass, Co Wicklow (1665-1666). Old Bawn House fell into disrepair in the early 1900s, and the chimneypiece and a carved oak staircase were moved to the National Museum. It was used as a storehouse when the surrounding lands were being developed for new housing in the 1960s. I still remember the storm 40 years ago when the House was finally demolished in 1976. Back in Beaumaris, Archbishop Bulkeley’s cousins remained prominent in politics and public life. When Thomas Bulkeley (1585-1659) became Governor of Beaumaris Castle, Charles I gave him the Irish title of Viscount Bulkeley of Cashel, Co Tipperary, in 1644. After the Restoration, the office of Governor of Beaumaris Castle passed from one generation to the next in the family until the death of the last Lord Bulkeley in 1822. The Tudor dynasty was descended from the Tudors of Anglesey, and so I was on the lookout for Tudor buildings in Beaumaris. Tudor Rose, the Tudor house on Castle Street, dates from 1416 and is said to be one of the oldest houses in Britain. Nearby, the George and Dragon on Church Street claims to be one of the oldest pubs in Wales. Despite the Georgian façade, the pub dates back to 1410, and inside it has a timber frame, exposed beams and a fireplace dating back hundreds of years. One of the roof trusses bears a painting the Sacred Heart of Christ, and a Latin prayer from 1610. Oliver Cromwell is said to have stayed there in 1643, and two Cromwellian soldiers were court-martialled for being drunk in the inn – although there is no record of what Cromwell thought of the Catholic symbolism and Latin prayers. Around the corner, the Red Boat Ice Cream Parlour at 34 Castle Street looks like an ordinary shop. But inside it is a mediaeval hall house, about as old as the George and Dragon, and a Tudor Rose adorns one of the trusses. The last Viscount Bulkeley died in 1822. But the Bulkeley family, and later the Williams Bulkeley family continued to hold large estates in the area until the family’s assets and estates were sold off at auction in 1920 in a major sale in the Williams Bulkeley Arms Hotel, now the Bulkeley Arms Hotel. But the family is still remembered in names and initials embossed on buildings around Beaumaris and the East Window in the parish church commemorates a member of the Williams-Bulkeley family killed during World War I. Between Beaumaris and Holyhead, it was impossible to resist the signs pointing to Llanfairpwllgwyngyll or Llanfair Pwllgwyngyll, the village that boasts the longest name in Europe. Most of the 3,000 people there speak Welsh, so they know how to pronounce the name and know what it means. But most refer it as Llanfairpwll, even as Llanfair PG. The long name, with 58 characters, was invented for promotional purposes in the 1860s, and refers to a little church in a hollow. Few tourists find the church, but all want to be photographed with the name at the train station or on the platform. Before leaving Anglesey, I visited one of the earliest Christian sites in Wales at the eastern tip of the island. Penmon is 5 km east of Beaumaris, and its name in Welsh means the end of the island. On the short journey, the landscape was evidence of the way Penmon limestone was extracted to build Birmingham Town Hall and in rebuilding Liverpool and Manchester after World War II. The stone was also used in building the Menai Suspension Bridge (1826) and the Britannia Bridge (1850). Saint Seiriol’s Church at Penmon may be part of the oldest remaining Christian building in Wales. According to tradition, the monastery was founded by Saint Seiriol in the early sixth century. Stone walls near the well may be part of Saint Seiriol’s church, making it the oldest remaining Christian building in Wales. By the 10th century, the monastery had a wooden church, and two high crosses probably stood at the entrance to the monastery. After Penmon was destroyed during Viking raids in 971, the church was rebuilt in stone, and Penmon survived the arrival of the Normans in the following century. The Priory Church was rebuilt in stone again in the 12th century, and the oldest parts of the church today date from 1140, making it the most complete building of its age in north-west Wales. In the 13th century, Penmon became an Augustinian priory. But the priory was in decline before the Reformation, and by 1536 the community included only the Prior and two other members. The priory was dissolved in 1538, and Penmon was acquired by the Bulkeleys of Beaumaris, who used most of the land for a deer park and built a dovecot near the church. The prior’s house, built in the 16th century, became a private house, but Saint Seiriol’s Church survived the Reformation. Much of the church was rebuilt in 1855, and the chancel now serves as the parish church. Inside the church, the crossing has richly carved pillars and Romanesque arches, and the decorative work suggests skills that may have come from Ireland. The south transept has a blind arcade of chevron-decorated Romanesque arches. Two 10th century High Crosses inside the church once stood at the entrance to the mediaeval monastery. The larger cross has inter-lacing decorative patterns, a hunting scene and a scene of the temptations of Saint Anthony. The smaller cross is decorated with knot-work and animal heads. The baptismal font may have been the base of another, third High Cross. All three pieces show Irish influences. Penmon Priory is now part of Beaumaris parish, and remains the finest and most complete example of a church of its period in Gwynedd. It worth going to the ends of Anglesey to see and to explore. Canon Patrick Comerford lectures in the Church of Ireland Theological Institute. This feature was first published in August 2016 in the ‘Diocesan Magazine’ (Cashel, Ferns and Ossory). Readings: Isaiah 1: 1, 10-20; Psalm 50: 1-8, 23-24; Hebrews 11: 1-3, 8-16; Luke 12: 32-40. In the name of + the Father, the Son and the Holy Spirit, Amen. Have you ever been burgled? It is a frightening and a traumatic experience for anyone who has suffered it. It is one thing to come home from a day’s work, or from a holiday, to find your house has been broken into. It is another to wake up and realise that as you were sleeping a thief has broken into your home, and is downstairs or in the next room. It happened to us once, in another house we were living in. It was in the days before mobile ’phones and cordless ’phones. I had been working late the night before and came downstairs to answer a mid-morning call. Unknown to me, the thieves were in the next room, having already gone through our kitchen. They were in there, having made themselves something to drink, had cut the lead to the video recorder, and were squatting on the floor, armed with the kitchen devil straight from the cutlery drawer, sorting through our other possessions. They must have remained very quiet. Instead of stealing our goods, they stole out the back door before I ever put the ’phone down or realised what had happened. It is a frightening experience, and it made us extra vigilant: extra bolts and locks, rethinking the alarm system, and so on. The police knew who the “likely suspects” were, but, you know, they can never guarantee that you are never going to be broken into again … and again. It is an experience that was also a reminder of our own vulnerability, and a reminder that what I own and possess is not really mine, and not mine for very long. Finding the kitchen devil on the floor was also a sharp reminder that even my life is not mine for very long. It is the passionate language of love, of passionate love. But then, of course, Christ demands our passion, our commitment, our love. Christ’s call to us this morning, the demands Christ is making on us this morning, are not just addressed to the Disciples. Christ is speaking to the disciples in particular, and teaching them about the kingdom (Luke 12: 1). But as he is speaking to them, someone in the crowd – like a heckler – interrupts and asks a question (see Luke 12: 13). The inner circle of the Disciples must have felt they were being broken into by those on the rims, those in the crowd of outsiders, the crowd or multitude following Christ but who were not among the Disciples. So Christ’s demands are made not just of some inner circle, for some elite group within the Church, for those who are seen as pious and holy. This is a demand he makes also to those on the margins, for the sake of those on the margins, makes on the whole Church for the sake of those on the margins. We are to be ever vigilant that we do not keep those on the margins on the outside for too long. They may appear like thieves trying to break in. But when we welcome in those on the outside who we see as thieves, we may find we are welcoming Christ himself. 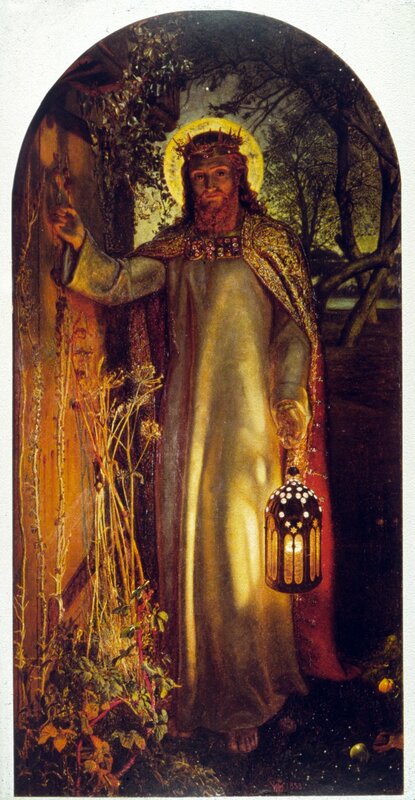 And in welcoming Christ himself, into our inner sanctum, we are making it a sign of the Kingdom. The Church needs to be place not where we feel secure, but where the outsider feels welcome, where they can feast and taste what the Kingdom of God is like. What is this Kingdom like? When shall we find it? In this Gospel reading, Christ tells the multitude – the multitude who are gathered just like the 5,000 who were gathered earlier on the hillside and fed with the multiplication of five loaves and two fish (Luke 9: 10-17) – Christ tells them that the kingdom is already given. My favoured translation of the Bible, the New Revised Standard Version (NRSV), says “it is your Father’s good pleasure to give you the kingdom” (Luke 12: 32), present tense. But the original Greek says “your Father was well pleased with you (or, took pleasure) to freely give the Kingdom to you” … ὅτι εὐδόκησεν ὁ πατὴρ ὑμῶν δοῦναι ὑμῖντὴν βασιλείαν. God wanted to do something good for the “little flock” (verse 32), and so freely gave them the kingdom – the reign of God – in which tables are open, status is upended, and all people are treated with dignity. In God’s Kingdom – on earth as it is in heaven – there is no scarcity, there are no class or gender barriers, there are no ‘insiders’ and no ‘outsiders’. Christ compares that Kingdom of God with a wedding banquet. When we go to a wedding, we have no control over what happens. In the first case, we have, thankfully, no control over who is getting married to whom. But, secondly, weddings break down all our petty snobberies and all our status-seeking. Whatever we think of the choice of bride or groom, we have no say at all in who is going to be a new brother-in-law, a new mother-in-law, and even into the future, who is going to be a new cousin to our children’s children. It’s enough to make you laugh. Sarah laughed when she was told about her future family (see Genesis 18: 12). There is a hint of that story in our Epistle reading this morning, when the writer reminds us of the faith of Abraham and Sarah (see Hebrews 11: 11, 13-16). In the Genesis story, it is actually only Abraham who says he was a stranger and a foreigner. But here both Abraham and Sarah are credited with the faith that underpins this realisation (see Hebrews 11: 13). God’s promise of the Kingdom multiplies beyond all our expectations, even beyond the expectations of modern Bible translators. We cannot control this. Those who come into the banquet may appear to us like thieves and burglars, brazenly breaking into our own family home, into our own family. But we may find that the thief is actually Christ trying to break into our hearts to let us know that the kingdom is already here. The word for master here is actually κύριος (kyrios), Lord, the word used in the Greek Old Testament for the Lord God by Jews who found the use of the name of God offensive and blasphemous. But using the word master for κύριος hides away God’s work, confusing the Lord, the “Son of Man” (ὁ υἱὸς τοῦ ἀνθρώπου, ho yios tou anthropou), with the “master of the house,” the householder (οἰκοδεσπότης, oikodespótēs). Think of how the word κύριος (kyrios), Lord, was used by Abraham as he addressed the three visitors to Abraham and Sarah at the Oak of Mamre. The strangers become angels, and the angels come to represent the Triune God. Had Abraham treated his visitors as thieves, where would we be today? Instead he sets a banquet before the Three, and finds not once but three times that he has an encounter with the living Lord (Genesis 18: 3, 13, 14), the Triune God, an encounter that leads Abraham and Sarah to a faith that ushers in the promises of the Kingdom. The Lord who arrives for the banquet and stands knocking at the door (Luke 12: 36) in this morning’s Gospel reading is the same Christ who says: “Behold, I am standing at the door knocking; if you hear my voice and open the door, I will come into you and eat with you, and you with me” (Revelation 3: 20). He comes in ways we do not expect, and at “the unexpected hour,” the time we “think nothing of” (ἧ ὥρᾳ οὐ δοκεῖτε, he hora ou dokeite, Luke 12: 40) – “an hour that seems like nothing.” He does not bother trying to tear down our puny defences. He sneaks around them instead. 32 Μὴ φοβοῦ, τὸ μικρὸν ποίμνιον, ὅτι εὐδόκησεν ὁ πατὴρ ὑμῶν δοῦναι ὑμῖν τὴν βασιλείαν. 33 Πωλήσατε τὰ ὑπάρχοντα ὑμῶν καὶ δότε ἐλεημοσύνην: ποιήσατε ἑαυτοῖς βαλλάντια μὴ παλαιούμενα, θησαυρὸν ἀνέκλειπτον ἐν τοῖς οὐρανοῖς, ὅπου κλέπτης οὐκ ἐγγίζει οὐδὲ σὴς διαφθείρει: 34 ὅπου γάρ ἐστιν ὁ θησαυρὸς ὑμῶν, ἐκεῖ καὶ ἡ καρδία ὑμῶν ἔσται. 35 Ἔστωσαν ὑμῶν αἱ ὀσφύες περιεζωσμέναι καὶ οἱ λύχνοι καιόμενοι, 36 καὶ ὑμεῖς ὅμοιοι ἀνθρώποις προσδεχομένοις τὸν κύριον ἑαυτῶν πότε ἀναλύσῃ ἐκ τῶν γάμων, ἵνα ἐλθόντος καὶ κρούσαντος εὐθέως ἀνοίξωσιν αὐτῷ. 37 μακάριοι οἱ δοῦλοι ἐκεῖνοι, οὓς ἐλθὼν ὁ κύριος εὑρήσει γρηγοροῦντας: ἀμὴν λέγω ὑμῖν ὅτι περιζώσεται καὶ ἀνακλινεῖ αὐτοὺς καὶ παρελθὼν διακονήσει αὐτοῖς. 38 κἂν ἐν τῇ δευτέρᾳ κἂν ἐν τῇ τρίτῃ φυλακῇ ἔλθῃ καὶ εὕρῃ οὕτως, μακάριοί εἰσιν ἐκεῖνοι. 39 τοῦτο δὲ γινώσκετε ὅτι εἰ ᾔδει ὁ οἰκοδεσπότης ποίᾳ ὥρᾳ ὁ κλέπτης ἔρχεται, οὐκ ἂν ἀφῆκεν διορυχθῆναι τὸν οἶκον αὐτοῦ. 40 καὶ ὑμεῖς γίνεσθε ἕτοιμοι, ὅτι ἧ ὥρᾳ οὐ δοκεῖτε ὁ υἱὸς τοῦ ἀνθρώπου ἔρχεται. 32 ‘Do not be afraid, little flock, for it is your Father’s good pleasure to give you the kingdom. 33 Sell your possessions, and give alms. Make purses for yourselves that do not wear out, an unfailing treasure in heaven, where no thief comes near and no moth destroys. 34 For where your treasure is, there your heart will be also. 35 ‘Be dressed for action and have your lamps lit; 36 be like those who are waiting for their master to return from the wedding banquet, so that they may open the door for him as soon as he comes and knocks. 37 Blessed are those slaves whom the master finds alert when he comes; truly I tell you, he will fasten his belt and have them sit down to eat, and he will come and serve them. 38 If he comes during the middle of the night, or near dawn, and finds them so, blessed are those slaves. By faith he received power of procreation, even though he was too old – and Sarah herself was barren – because he considered him faithful who had promised. By faith also, Sarah herself, a barren woman, received the ability to establish a posterity beyond normal age, since she was considered the faithful one who had promised. which takes away our sins and brings pardon and peace. (Revd Canon Professor) Patrick Comerford is lecturer in Anglicanism, Liturgy and Church History, the Church of Ireland Theological Institute. This sermon was preached in Saint Bartholomew’s Church, Ballsbridge, Dublin, at the Sung Eucharist on Sunday 7 August 2016. I know it is not traditional to have a sermon at this early morning Eucharist, but once again I thought it might be useful to share some of the thoughts I have in preparation for my sermon later this morning at the Sung Eucharist at 11 a.m. In this morning’s Gospel reading, Christ tells the multitude – the multitude who are gathered just like the 5,000 who were gathered earlier on the hillside and fed with the multiplication of five loaves and two fish (Luke 9: 10-17) – Christ tells them that the kingdom is already given. Allow the stranger among you, and the stranger within you, to open that door and discover that Christ is not a thief trying to steal what you have, but is the Lord who is trying to batter our hearts and tear down our old barriers so that we can all feast together at the new banquet. (Revd Canon Professor) Patrick Comerford is lecturer in Anglicanism, Liturgy and Church History, the Church of Ireland Theological Institute. This sermon was preached in Saint Bartholomew’s Church, Ballsbridge, Dublin, at the Said Eucharist on Sunday 7 August 2016.